Now you can access Code of Civil Procedure (CPC) anytime you need it. Manupatra Code of Civil Procedure (CPC) is a legal research resource which gives you instant access to Code of Civil Procedure (CPC) offline without using internet on your device. Manupatra is please to present CPC in its best ever readable and usable format. 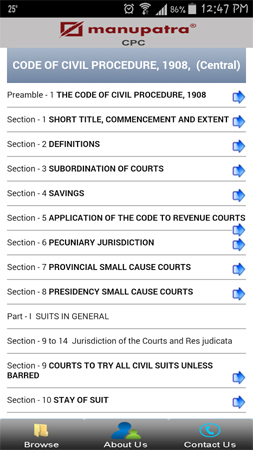 Complete Code of Civil Procedure is available section wise which is quickly browsable. Just scroll through sections on your smart phone.